The North Carolina Collection Gallery, a public service of the North Carolina Collection, presents a variety of exhibits that feature literature, photographs, and artifacts from the North Carolina Collection’s extensive holdings. 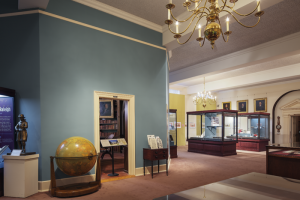 Highlights include the furnishings in three historic rooms and exhibits on topics including early attempts at English settlement, the North Carolina gold rush, rare ornithological prints, the original “Siamese twins” Chang and Eng Bunker, and much more. Gallery exhibitions are free and open to the public. Visitors may either browse on their own or arrange for guided tours with staff. The Gallery’s facilities are also available to the university community as a meeting area for smaller seminars, classes, and other special programs. K-12 teachers interested in providing their classes with multi-disciplinary field trips should consider UNC-Chapel Hill’s campus. Situated within a short walking distance of one another are the Ackland Art Museum, Morehead Planetarium, and the North Carolina Collection Gallery. Thus, a “research triangle” of art, science, and social-history experiences and tours can be arranged among these three institutions. Faculty members teaching classes of all sizes and disciplines are encouraged to contact Gallery staff to discuss assignments and visits related to our collections. The Gallery’s facilities are also available to the university community as a meeting area for smaller seminars, classes, and other special programs. The Gallery is located on the second floor of Wilson Library. Driving directions, hours, and parking information can be found on the Library’s hours and locations page. Contact information for the Gallery can be found on the Library’s staff directory page. The Gallery is part of a long history at UNC of using museum objects as educational tools. More than two centuries ago, in 1795, the university’s board of trustees appointed Charles Wilson Harris the school’s first “keeper of the museum.” Harris was a native of Cabarrus County, N.C., and a recent graduate of the College of New Jersey (now Princeton). As keeper, he began to assemble at UNC a collection of artifacts and natural history specimens, displaying them in his “cabinet of curios” for students and visitors to the small, new campus. 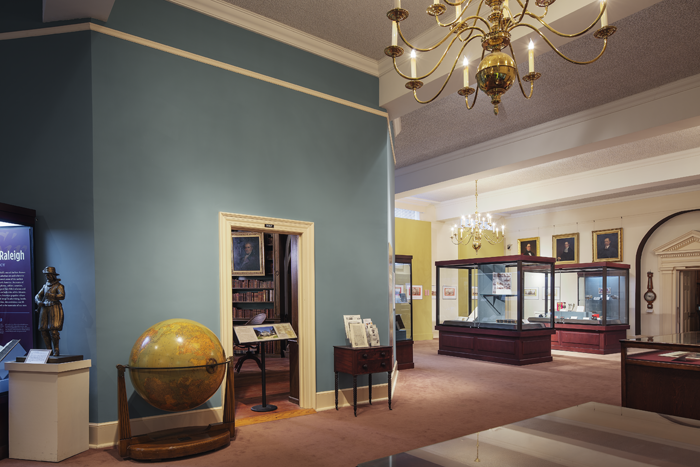 Today, the North Carolina Collection Gallery serves as a descendant to Charles Harris’s early museum and library work. The Gallery, which opened in December 1989, is responsible for overseeing more than 50,000 museum objects for the department, as well as presenting a variety of exhibits that feature literature, photographs, and artifacts from the North Carolina Collection’s extensive holdings.